Thanks for visiting my website! 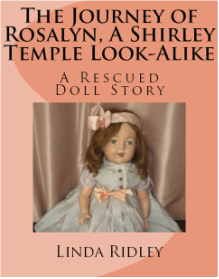 I just published the second book in my Rescued Doll Story series: "The Journey of Rosalyn, A Shirley Temple Look-Alike". This book is another historical reimagining of a damaged doll's life. I was gifted with this doll by my sister Sue who found her at a garage sale. She looked quite a bit like Shirley Temple to me and because so many love and enjoy Shirley Temple movies and dolls I decided to incorporate these into my story about Rosalyn. I researched dolls of this era and as I did so I was reminded often of the turbulence of the WW II years during which this doll would have been played with. I decided to bring into my story a little Jewish holocaust survivor whose name just happens to be Rosie. I hope you will pick up a copy of my latest book and enjoy Rosalyn's story and the many photos of her happy life and of her rescue. Welcome to my website! 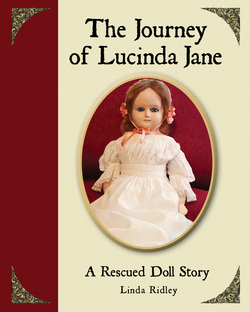 I have recently published my first book - The Journey of Lucinda Jane: A Rescued Doll Story. This touching tale follows a beautiful, hand-finished doll as she embarks on a 140-year journey from beloved plaything, to damaged toy, to an exciting rescue and resurrection. Join me on the adventure of Lucinda Jane and stay tuned for her continuing series . . .